Coronary artery disease remains one of the leading causes of death in the world today. Within CAD population, there are an increasing number of patients with disabling related to left ventricle function. 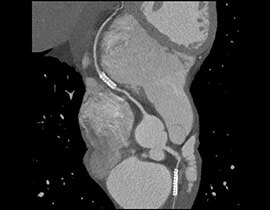 In parallel to the developments in physiological imaging, CT technology has sought to offer a non-invasive assessment to detect CAD using anatomical information. Integration of clinical findings from a coronary CT angiography and a physiological study performed on a PET or SPECT system offers a non-invasive coronary artery assessment that is a valuable asset for diagnosis and treatment. CardIQ Fusion* offers you 2D, 3D, or reformatted protocols to help you analyze and measure the extent of compromised coronary arteries. 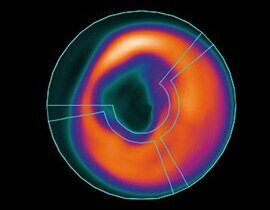 With CardIQ Fusion, you can visualize SPECT and PET physiological perfusion and viability data under stress and rest conditions. And it allows you to combine the anatomical and physiological data in fused 2D or 3D views. Extract, render, and display coronary vascular tree images. Reformat standard axial CT, SPECT and fused images automatically. Track, extract and display coronary arteries. Measure coronary vessel parameters including stenosis, density, and length. Dynamic AVA gives you the ability to add new vessels into the analysis with a single point deposit at any time. Vessel label data base provides names for each protocol for easy correction or addition of a vessel label. Coronary vessel analysis tool lets you track, extract, visualize, and measure coronary arteries. Cath orientations let you interactively position the view in RAO/LAO and CRA/CAU orientations. Cine mode lets you page through all slices of a vessel or through a limited range. Batch movie mode allows you to save multiple views of the heart and display them in a movie sequence. CardIQ Fusion offers you a set of pre-defined protocols that you can modify to create your own customized protocols. 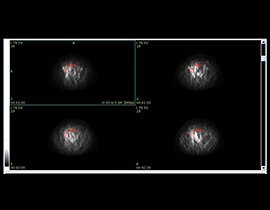 CardIQ Fusion accepts standard CT, PET, and SPECT image sets acquired on qualified GE scanners using the appropriate cardiac imaging software. These images must meet the same image requirements as those for the basic Volume Viewer application. The CardIQ Fusion option can be installed on a GE AW Workstation with AW Basic Display, Volume Share 21 or above platforms. 1. 2GBRAM and 2 display monitors required.